The balanced scorecard (BSC) was developed in the 1990s and quickly rose to popularity among organizations large and small. The revolutionary management tool shifted the traditional focus on revenue and financial health to a more holistic and comprehensive understanding of a business’s performance. Today, 70% of businesses use a balanced scorecard at least partially to manage their strategic goals. Pretty impressive for a system that is less than 30 years old. Let’s take a look at how a balanced scorecard works and how you can use Lucidchart to make your own. The balanced scorecard is a management system originally developed by Robert Kaplan and David Norton to help organizations achieve their business objectives and execute key strategies. In the past, organizations tended to focus on primarily financial metrics and objectives to manage their business and develop strategies. While finances and revenue play an important role in the health and performance of any business, this focus gives an incomplete picture of success (or failure). Within these four pillars, leaders outline their strategic objectives for each business perspective and link those performance measures with a strategy map. 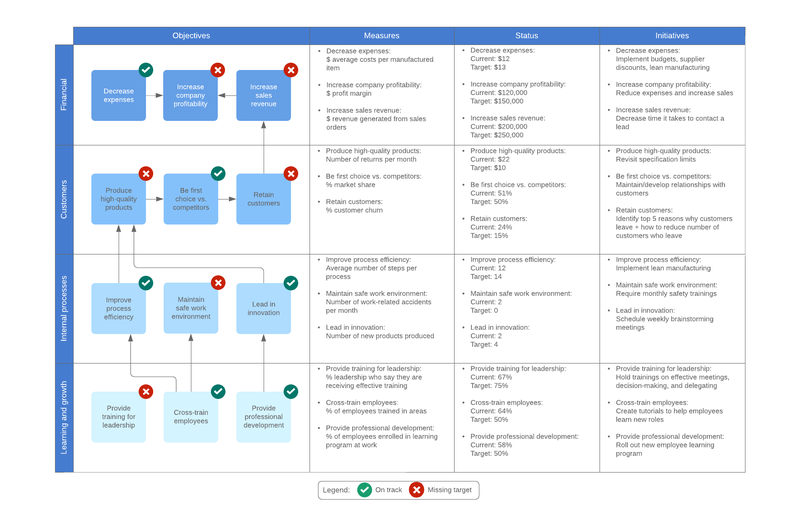 The strategy map shows how each objective relates to one another so leaders can get a high-level view of their organization’s strategy at a glance. Keep in mind that, while performance measurement is a component of the balanced scorecard, the BSC is first and foremost a management system. By combining the four primary business perspectives, the BSC helps businesses and their leaders make better-informed decisions and lead with confidence. The balanced scorecard evaluates the health of your organization by considering four main perspectives. Each perspective focuses on a different part of the business to give leaders a comprehensive and nuanced understanding of the company’s performance. This perspective is also called “organizational capacity.” It looks at organizational performance through the lens of human capital, culture, technology, and infrastructure. For instance, are your employees using your technology stack to execute tasks and manage processes? Does your organization provide adequate training and resources? What steps are you taking to remain competitive? The learning and growth perspective considers how well information and knowledge are captured and implemented by employees to create a competitive advantage. The next perspective focuses on how well your internal processes are operating. Are there gaps, delays, or bottlenecks in the pipeline that need to be addressed? How can you streamline your processes for greater efficiency and effectiveness? How quickly can your organization adapt to changing business needs or conditions? The customer perspective asks “What is important to our customers and stakeholders?” This perspective focuses on finding new customers, building brand recognition and trust, and increasing customer satisfaction. In other words, how well are you serving your customers and the stakeholders your organization was designed to serve? The final piece of the puzzle is the organization’s financial state. Yes, this is the perspective too often over-emphasized in the past. But, though finances are lagging indicators of past decisions, they are still an important part of any organization’s health and key to understanding overall performance and creating strategies for the future. As its name suggests, one of the most significant advantages of using a balanced scorecard is creating a balanced understanding of your organization’s performance. But that’s by no means the only benefit. Use a balanced scorecard to reap the following benefits and competitive advantages. The balanced scorecard helps business leaders quickly distill the most important priorities for each arm of their organization and align those strategies for optimal performance. The balanced scorecard is particularly useful for large organizations who could easily lose sight of one or more perspectives. By bringing together four primary perspectives, senior leadership can create clear strategies that align across the organization. With better strategic planning comes improved outcomes for projects and initiatives across the organization. When leaders define the strategic priorities at each level, departments and teams can then ensure their projects align appropriately with the overarching goals of the business. For example, when employees understand the broader organizational objectives, they can set personal and team goals more effectively and plan and prioritize projects that align with the business strategy. Though the balanced scorecard is a management system first, it is also a powerful tool for measuring performance and improving performance outcomes. A well-defined balanced scorecard creates a structured framework for measuring performance and helps organizations communicate performance clearly. By combining strategic goals with concrete performance metrics, the BSC helps organizations and teams execute the low-level tactical efforts needed to achieve their high-level goals. There are multiple ways to create and visualize your balanced scorecard. 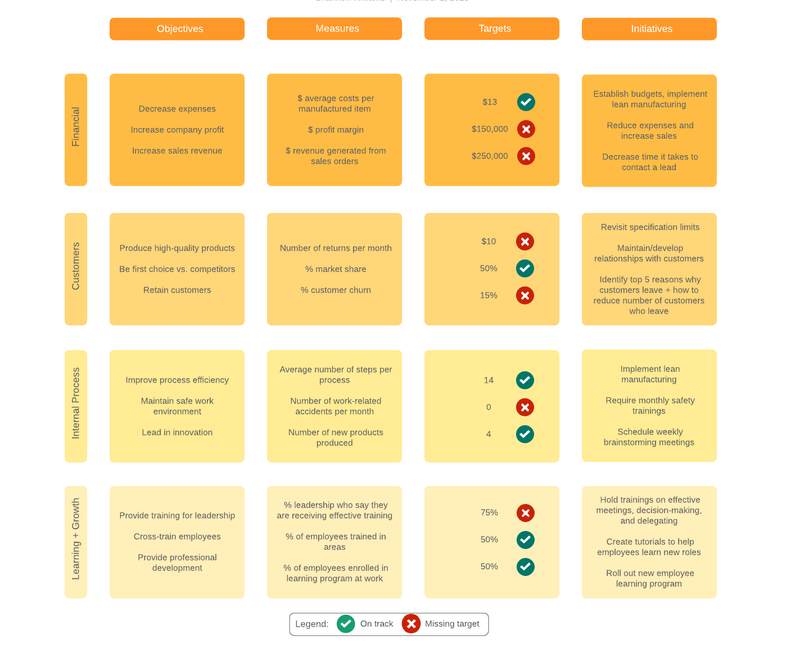 Consider starting with a basic balanced scorecard template or build your own from scratch. Customize it to your needs and do what works best for you. 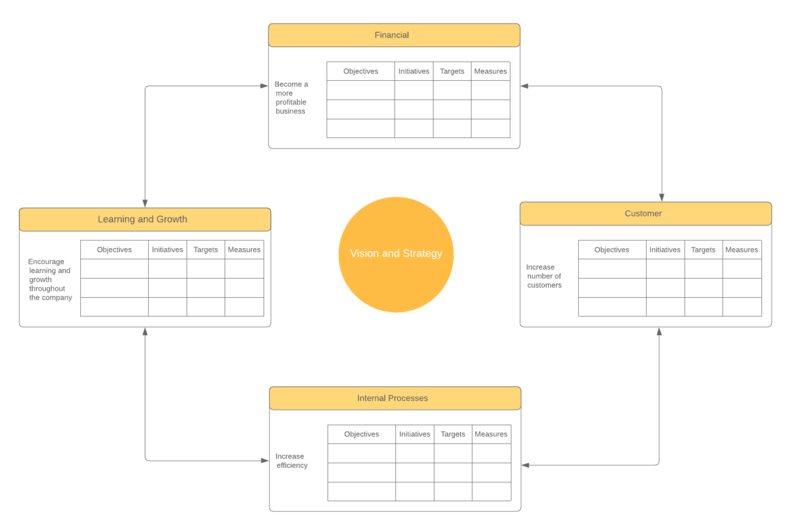 Once you have your balanced scorecard template ready, you can start filling in the blanks. The first step to building your balanced scorecard is to identify your strategic objectives for each business perspective: learning and growth, internal business processes, customer, and financial. Remember to keep goals specific but high-level. We’ll drill down into more specific measures of performance for each objective later. Next, you will create a strategy map. A strategy map is a diagram that shows the connections or relationships between your strategic objectives. This is a useful tool for quickly communicating your organizational strategy and demonstrating how each department, team, or individual contributes to the broader goals of the company. An easy way to show these relationships on your diagram is with directional arrows to show the strategic path and connection between each goal. The last step is to outline the specific metrics you will use to measure success for each strategic goal. For instance, if one of your goals for your internal business processes is to lead in innovation, you could measure success by the number of new products produced. The key here is to list out the measures for each objective and then outline the current state metric and the future goal. So, if you’re measuring the number of products you produce, you would write the current production number along with the target number. Together, these outlined measures will help you quickly see how you are performing on any given objective and which areas may need additional support. Lucidchart is a diagramming solution that helps executive leaders, managers, and employees create powerful visuals for their businesses. 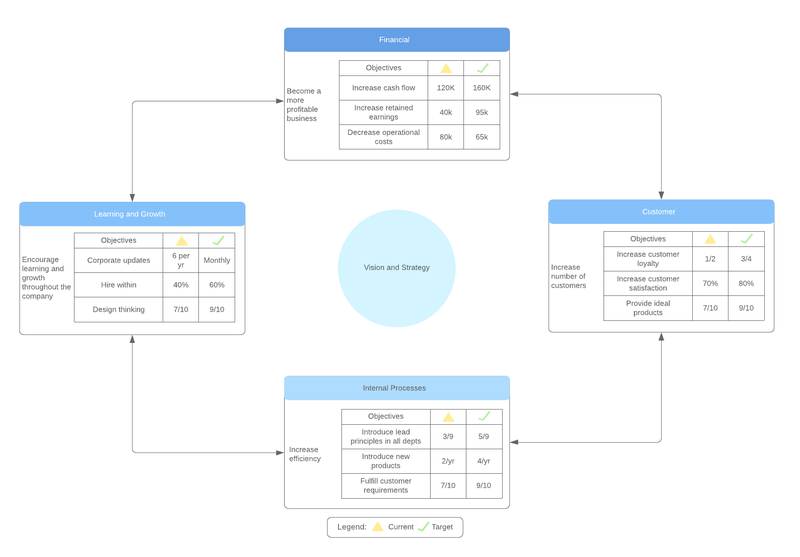 Use Lucidchart to create a custom balanced scorecard that elegantly communicates your strategic goals and keeps everyone on track to meet performance benchmarks. Whether you customize a pre-made template or start your own diagram from scratch, you can create beautiful visualizations at the click of a button in Lucidchart. Data linking lets you import data directly to your document so you can get real-time updates and see all your information at a glance. Plus, conditional formatting lets you build visual cues right into the design so you can quickly see progress on goals or identify metrics that need the most attention. The beauty of the balanced scorecard is in its simplicity and flexibility. With the help of Lucidchart, you can quickly structure a strategic management system that works across the entire organization.